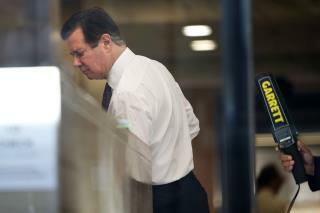 (Newser) – President Trump's former campaign chairman is going to jail. Paul Manafort was ordered into custody Friday after a federal judge revoked his house arrest, citing newly filed obstruction of justice charges, reports the AP. The move by US District Judge Amy Berman Jackson came after prosecutors accused Manafort and a longtime associate of witness tampering. “You have abused the trust placed in you six months ago,’’ Berman Jackson told Manafort, who was out on bail and under home detention when the alleged tampering took place. “The government motion will be granted and the defendant will be detained.” It wasn't immediately clear where Manafort would be held, reports the Washington Post. Er, Manfort WAS NOT jailed as part of Mueller's investigation and his jailing has nothing to do with charges Mueller is investigating. Manafort was granted bail, generally an indication that the prosecution's case will require substantial improvement to secure a conviction, that had conditions. In cases of bail the onus is typically on the released defendant to ensure complete, unequivocal compliance (revocation can come on seemingly minor grounds). Here, the government has seized on what is unclear but seems to be sufficient for Manafort to get the same treatment as anyone on bail in that the mere appearance of wrong doing lost him his provisional freedom. Of course, this is the 'witch hunt' and a crooked judge is never out of the question. He's going to be in a "special" section of the jail. That means he will be given different treatment than the other inmates.